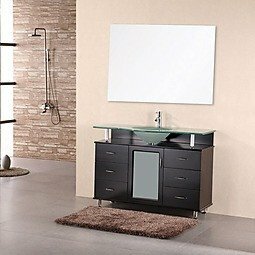 Huntington 48" Single Sink Vanity - Design Element - SKU#DEC015C The Huntington 48" vanity set is elegantly constructed of quality woods. The integrated tempered glass countertop and flowing curved sink design bring contemporary elegance to any bathroom. The seamless oval sink beautifully showcases the frosted glass countertop. This unique design includes a soft-closing cabinet door and six pullout drawers, all adorned with chrome finish hardware. The Huntington Bathroom Vanity is designed as a centerpiece to awe and inspire the eye without sacrificing quality, functionality, or durability. Dimensions 48â€ x 22â€ x 34â€ Faucets not included.